Progressive field is the home stadium for the Cleveland Indians. Located in the downtown area of Cleveland, Ohio, it is part of the Gateway Sports and Entertainment Complex. A Sports Illustrated fan poll conducted in 2008 rated it as the best ballpark in Major League Baseball. 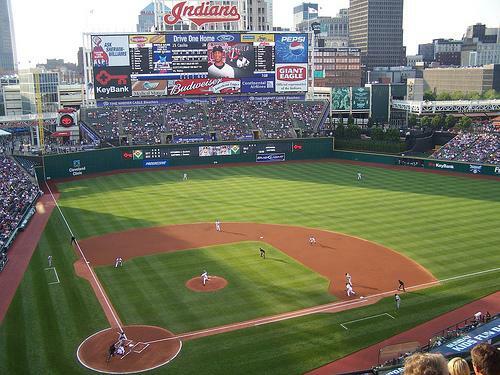 The original name of the ballpark was Jacobs Field until the team changed the name in 2008. In May 1990, voters approved a 15-year sin tax on alcohol and cigarette sales to finance the new Gateway Sports and Entertainment Complex. Richard Jacobs, a former owner of the team, purchased the naming rights for the Cleveland Indians’ home through the year 2006. Jacobs Field hosted the World Series for the first time in 1995 – won by the Atlanta Braves. Then in 1997 the Indians hosted another World Series, losing this time to the Florida Marlins. 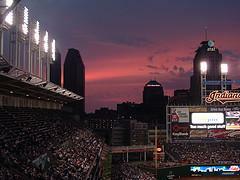 Jacobs Field set attendance records after selling out 455 consecutive games between June 12, 1995 and April 4, 2001. To honor the record, the Cleveland Indians retired the 455 number. In 2008, the Boston Red Sox beat the Indians’ record with 456 consecutive sell outs. Before Jacobs Field, the Cleveland Indians called the Cleveland Municipal Stadium home since 1947. During the 1980s, Cleveland Municipal Stadium was showing its age. Not only was it too old, the stadium lacked the luxury boxes and other amenities of modern ballparks. In efforts to raise funds for a new stadium, the city put a tax cigarette and alcohol sales tax to a vote in May of 1990. The public voted yes to the sales tax. Prior to construction, Indians legend Mel Harder, who pitched the Opening Game at Cleveland Municipal Stadium in 1932, threw out the ceremonial first pitch. The ballpark opened as Jacobs Park, named for former team owner Richard Jacobs, who purchased the naming rights through 2006. The cost of the ballpark was about $175 million. Richard Jacobs put up about $91 million and the rest of the money came from special taxes. Cleveland Indians played its first game at Jacobs Field on the 4th of April, 1994. On this historic day, President Clinton threw out the first pitch. To the delight of the fans, the Cleveland Indians beat the Seattle Mariners in 11 innings by a score of 4 to 3. In between these two incidences the Indians renamed the stadium as Progressive Field when the Progressive Corporation bought the naming rights to the stadium. The Progressive Corporation mounted a new sign with the name “Progressive Park” on March 25, 2008. 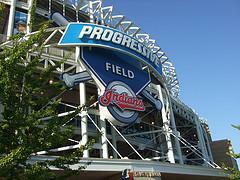 When they discovered that another park already used that name, they changed the name to Progressive Field. The field dimensions of Progressive Field are 325 feet down the left field line, 405 feet to center field and 325 feet down the right field line. THIS IS NOT A GAMBLING WEBSITE Copyright © 2010, Guide-to-Baseball-Betting.com Information contained within this website is for entertainment purpose only. Use of this information in violation of State, Federal, or Local laws is strictly prohibited. Past performance is not a guarantee of future results. Grab Your Copy of the FREE Baseball Betting Guide And NEVER Struggle Betting on Baseball Again! Don't worry -- your e-mail address is totally secure. We hate spammers too!